Following this article, the Daily Fail has more speculation on offer. Did legal battle block premiere of Emma Thompson’s period drama Effie Gray? In 2005, Damian O’Hare played John Everett Millais in “The Countess”, so while have no idea who ripped off whom here, I seize the opportunity to post a “Countess” picture. Just click the picture and you’ll get to the online gallery of photographer Jonthan Keenan who did the promo shots for this production at the Royal Exchange in Manchester back in 2008. There are a couple of pictures of Damian O’Hare, plus one seriously alien looking ones of Stephen Tompkinson. This is the first picture I’ve ever seen from the 2003 production of Henrik Ibsens’s “Ghosts” at the Lyric Theatre in Belfast. 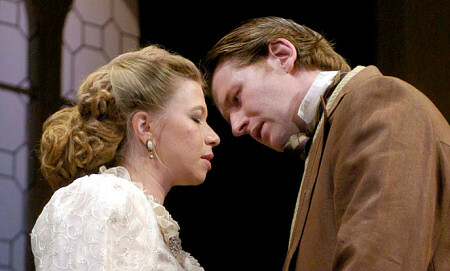 Directed by Conall Morrison, the play starred Damian O’Hare as Oswald Irving (orginal: Osvald Alving – the names were changed to adjust to the play’s setting in Northern Ireland) and Stella McCusker as his mother. 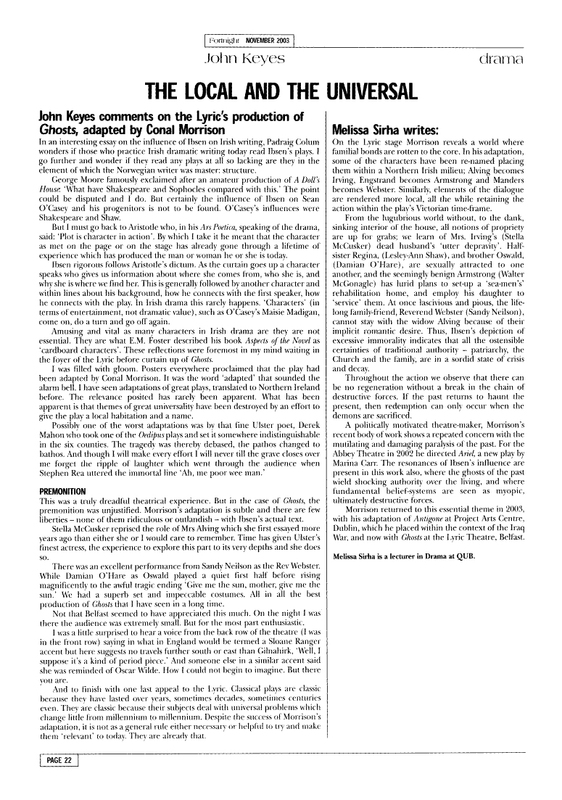 And here’s a review of “Ghosts”; I don’t think I’ve posted it before. While Damian O’Hare played a quiet first half, before rising magnificently to the awful tragic ending ‘Give me the sun, mother, give me the sun’. An Easter egg of the different kind: Stuart Wilsonhas has put his play “East” up on youtube. “East” is about the “trials and tribulations of partnering an Indian restaurant in 1990’s Manchester”. The play was performed in London’s Soho Theatre on Friday 5th December 2003, by actors Avin Shah (The Bill) and Damian O’Hare. Enjoy! 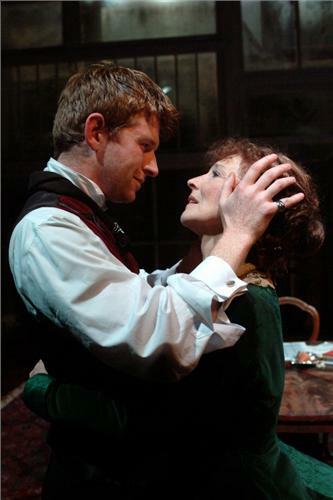 … Damian O’Hare as John Everett Millais in “The Countess”. The article, dated 24 April 2011, is about “The day I sat in Emma Thompson’s kitchen and accused her of stealing my movie”. Not going to touch that, but I’m fascinated by the rumour that Orlando Bloom might be cast as Millais. Stroke of genius, they could be twins! Thanks to everybody who participated in the “Double Feature” contest. The correct answer was, of course, “Miller”. Congratulations! A mail has been sent to you asking for your full address; as soon as I receive your reply, the book will wing its way to you, LaTisha.